This double reclining sofa offers personalized comfortable seating on a large scale. The end seats recline separately from the rest of the sofa so that each person can find their ideal comfort level. 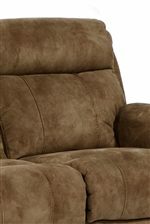 The reclining pull on the couch is built-in to the side of the arm making it more fashionable than most recliners. The Latitudes - Casino Double Reclining Sofa with Pillow Arms by Flexsteel at AHFA in the area. Product availability may vary. Contact us for the most current availability on this product. The Latitudes - Casino collection is a great option if you are looking for Casual furniture in the area. Browse other items in the Latitudes - Casino collection from AHFA in the area.